Relationships -- with our clients, insurance co-partners, employees, and the community -- are the core of HWI, and have been since its founding in 1961 by Herbie L. Wiles. Not only does HWI continue to do business with its first two independent insurers, Auto Owners Insurance Co. and the former Aetna Life & Casualty (now The Travelers), but most of our clients turned to us because their friends and family did the same and recommended our agency. "The House that Trust Built" started at 17 Cordova St. in downtown St. Augustine, not far from the current location, but was outgrown by 1966. Herbie looked for a new office that fit his vision for the company. "I always thought about our business dealing with families and individuals," he said. "So I wanted a big house." A vacant 1900s-era home at 78 Saragossa St. was rescued and renovated, and served well at 400 North Ponce de Leon Boulevard until 1980, when more room was needed and another dwelling was hooked to the first. The majority of the agency's growth has come from new business, but HWI acquired The Carl D. Langston Agency in 1974, the T.R. Weathersby Agency in 1976, and the Pinnacle Insurance Group, headed by HWI Benefits Sales Executive Don Lohr, in 2007. 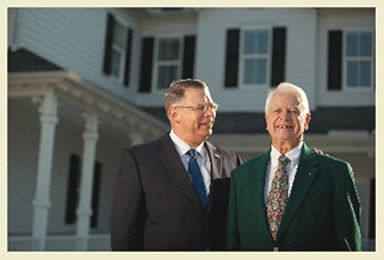 Douglass F. Wiles, now president, joined his father's business in 1979, and Wayne Howell, now vice president, began in 1983. Today there are three HWI owners: Doug, Wayne, and Herbie, CEO and founder. In 2006, the leaders saw that the demands of the computer age would only call for more infrastructure, and began planning a new office. After the original historic building was donated to the Old Jail to become a period museum, construction began on the next "House that Trust Built." Being available to clients with no disruption in service, no matter what disaster might strike the area, was critical for the new structure. The nearly 10,000-square-foot building created will withstand winds up to 150 miles per hour and is equipped with a generator that will power the office for a week. Should it ever be needed, HWI even contracts to have temporary offices set up in the parking lot, with secure satellite internet and phone service, so clients can reach their agent when they need him or her most. Almost all HWI employees hold at least one professional insurance designation, and all constantly update their skills. Find out more about your agent here. We take pride in staying ahead of the latest insurance trends and, because of our status as an independent agency, being able to recommend from the best of the best options in the market. Community service, both as a company and as individuals, is one of our highest values, as is earning your trust (it's what built this house, after all), and building relationships that endure. Our independence allows us to work solely in the interest of our clients. Since we do not represent a specific company, we are free to select the best products and services from many financial providers in the marketplace. This independence ensures our objectivity and allows us to completely focus on quality, value, and suitability for our clients. The end result? Our clients can trust that the recommendations we make are based on their specific needs. Our clients’ needs come first. We’re passionate about seeing our clients achieve their financial goals and dreams. That’s why we’re here. We will always put our clients’ interests above our own. Trust and integrity are our core values. Service and performance are the foundation of our business. We focus on constant communication to ensure our clients remain on track to achieve their objectives. We provide personal quarterly updates, a client newsletter, educational seminars, and on-line access to client accounts. Our staff has developed a reputation for delighting our clients with outstanding service.